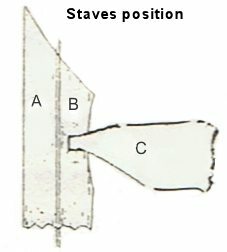 Very rarely, the infiltration appear in top of stave but rather in the half of the external thickness and very rarely in the half of the internal thickness of the stave this last being protected by the passage of the barrel head. The repairer should research with patience and persistence the precise point of the leak. This one will always be at the height of the wine mark, the liquid always leaks naturally downwards. The repairer will scratch the wet area and will look for the origin leak point while ascending the wine mark upwards. He should not hesitate to repeat several times this same gesture in order to localize very precisely the leak point. Press in this small hole a small wood cone (or plug), slowly, with the help of a small hammer, in the intention to stop the passage of the liquid. 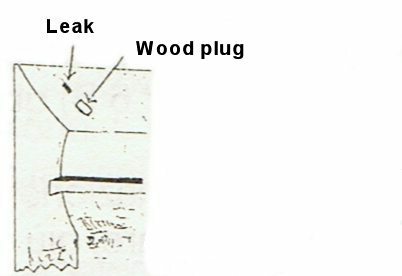 The plug should penetrate between 1 to 1,5 cm but not more otherwise one risks to crack the stave. 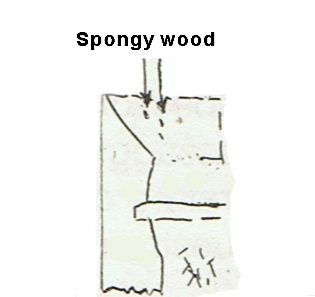 This plug is a cone cutted in a hard wood (oak). 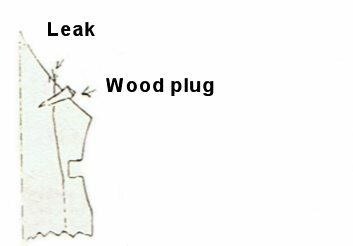 The plug end exceeding of the stave will be cut off with the help of a cutting tool while paying a lot of attention to incise the cone simultaneously all around in order to avoid damaging the wood. 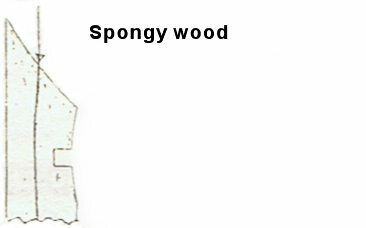 This small wood cone should be sufficient to stop the sponginess. In the case or, probably because or an experience lack, a small leak persists, it will be necessary to insist in the very precise research of the leaking point and not to hesitate to insert one or two small plugs. 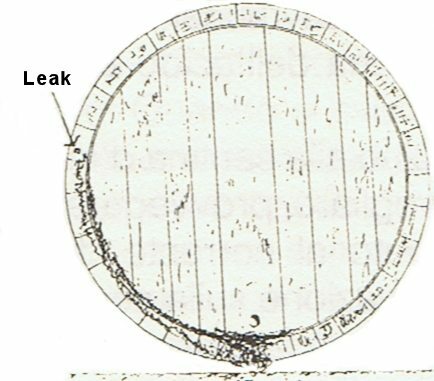 There is not hazard to aggravate this type of leak, at the only condition to avoid the extrem internal side of the head of the stave.